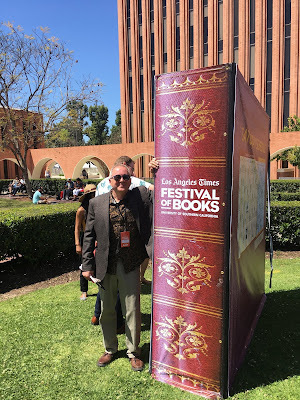 I got home from the L.A. Times Festival of Books very late last night. 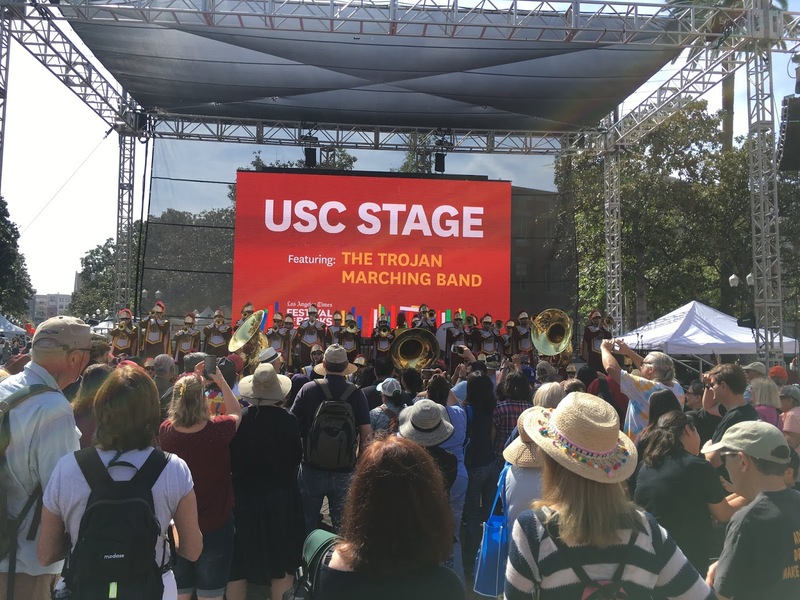 It was a good, successful event and weekend, helped considerably by my sisters Elisabeth and Brenda, who pointed me to Los Angeles gems I never would have found on my own. 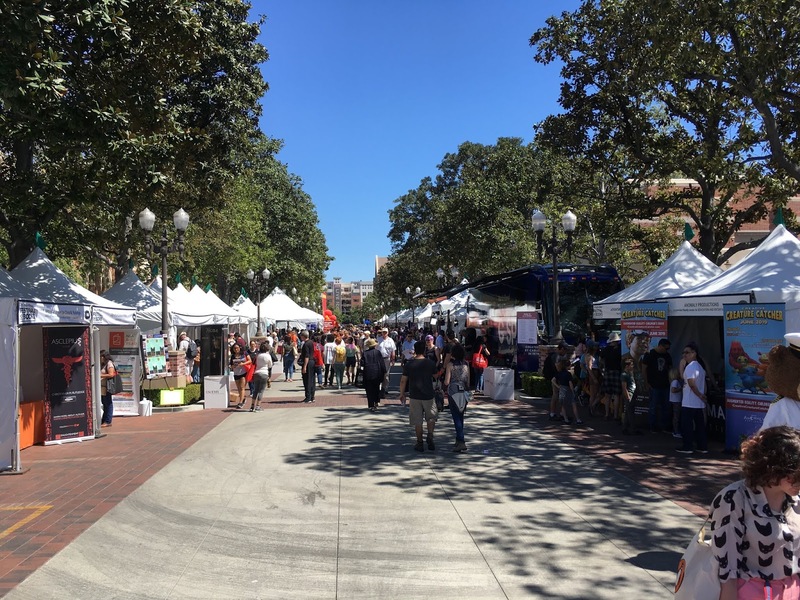 The festival itself is huge; mid-Sunday I was still discovering new nooks I hadn't visited. They say 100,000 people attend but it never felt that crowded. Beautiful weather. 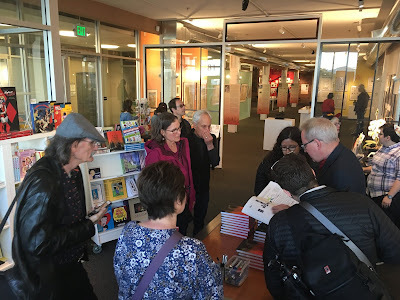 Lots of good conversations with people who love books. A representative stretch of the L.A. Times Festival of Books. 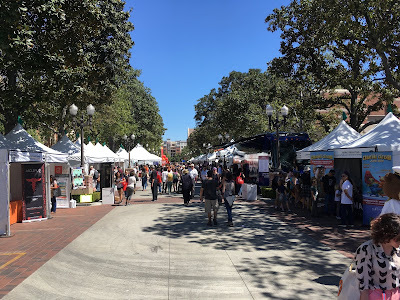 There were a dozen boulevards like this lined with tents--mostly small publishers or even self-published authors, but also a few big companies. Not a bad showing by comics folks: DC, Marvel, and Oni Press sent small delegations and, again, there were a lot of small-press comics. 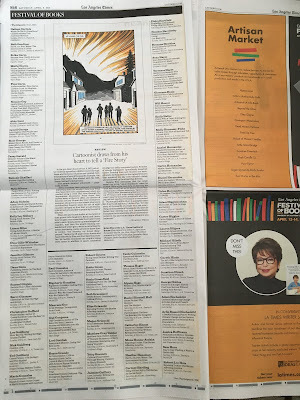 The L.A. Times printed a 28-page program that listed speakers, events, schedules, maps. I took up a big chunk of page 16. The band showed up Sunday morning. Very entertaining. 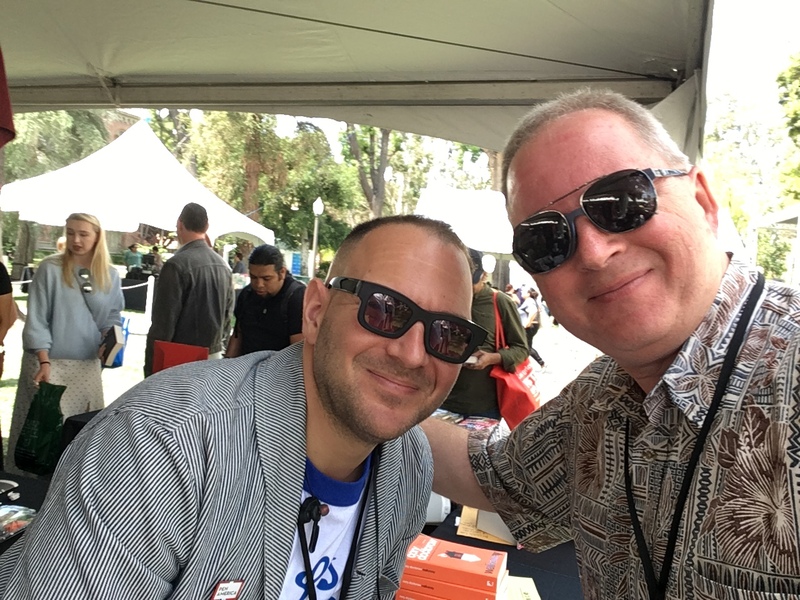 Weekend highlight: I met writer Cory Doctorow! 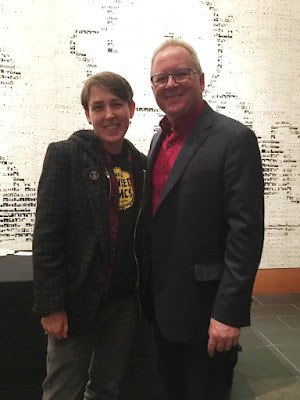 Cory wrote a really nice review of "Whatever Happened to the World of Tomorrow?" a few years ago, and his love of retro-futurism is right up my alley. I'd planned to attend a talk he was giving Sunday afternoon in hopes of just getting a chance to say "Hi." Instead, I found him doing a spontaneous, unannounced booksigning Sunday morning, and we got to have a real conversation. And then I bought his latest book. The panel I was there to do, "Earth, Air, Fire, Water--the Environment in Crisis" (I was "fire"), went great. 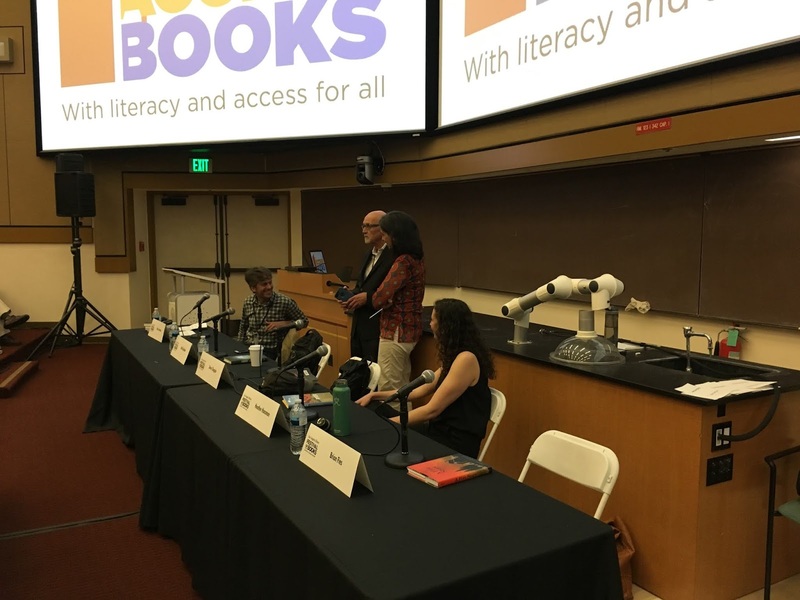 The other panelists and I got on very well, and I think we hit a good balance of dread and hope. When I scouted out our panel's venue on Saturday, I was worried because it was a long distance from the rest of the festival action. I thought we'd be lucky to draw a dozen people. Instead we got about 150! 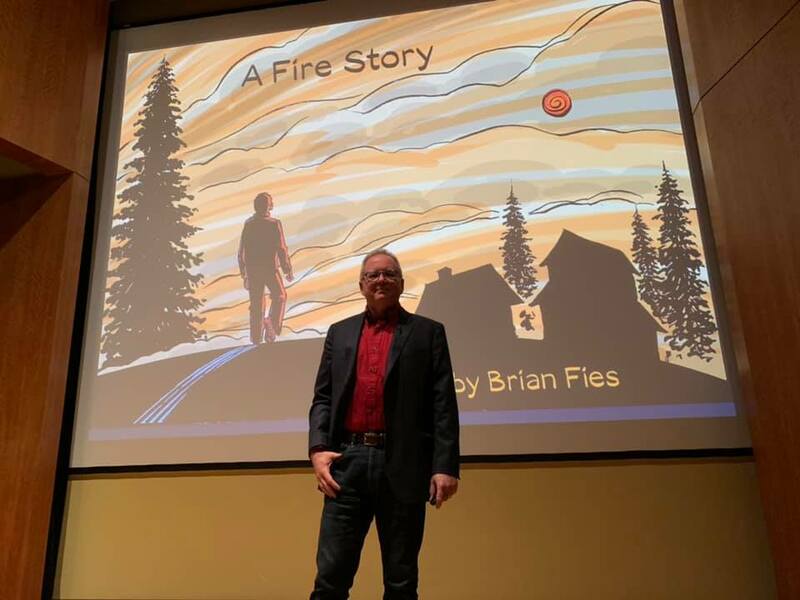 The booksigning after was fine; they sold all their copies of "A Fire Story," which wasn't many--maybe 15 or 20?--but I was happy with that. The lecture hall where my panel was held. This was early, when people were still trickling in. 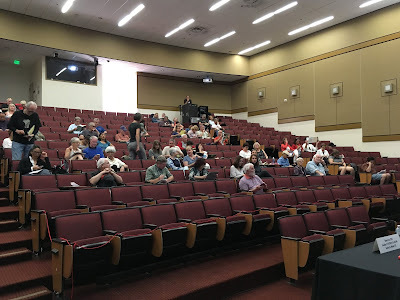 We got about 150 (that's what I do while other panelists are talking--count heads). 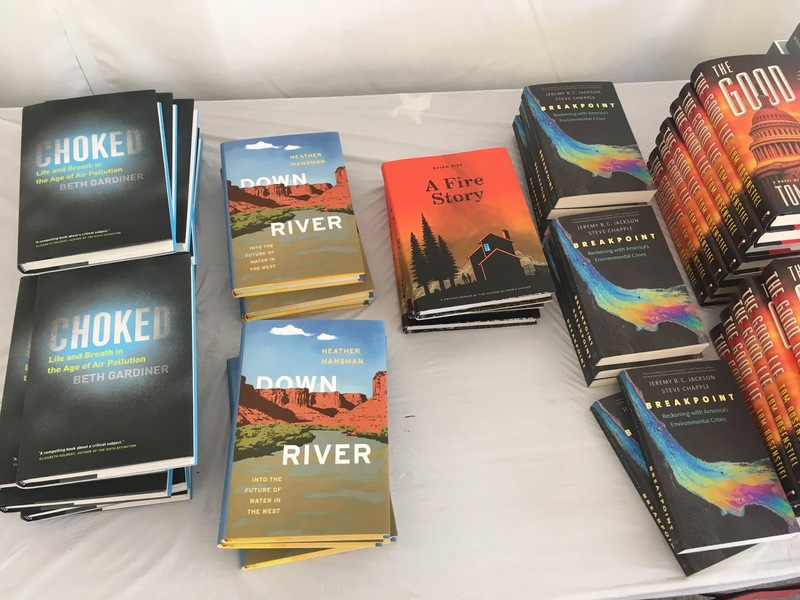 All of the panelists' books for sale near the booksigning tent. 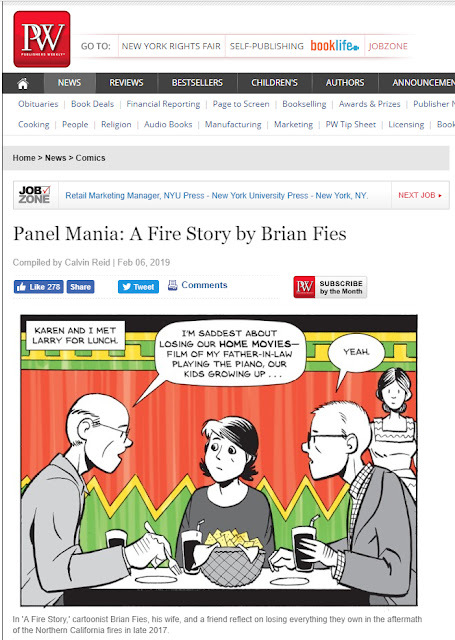 A lot of the "Fire Story" copies were already gone. 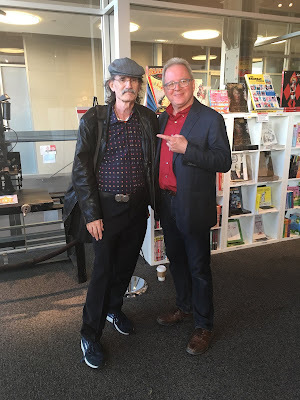 Here's 52 minutes of me with host Michael Krasny on KQED Forum this morning. Originally scheduled for half an hour, I was asked to do a full hour after Mr. Krasny read my book. He was very prepared, and a good listener. We took listener calls and emails, some pretty intense. KQED staff seemed very happy with the program. An hour went incredibly fast! Preparing to go on the air with Michael Krasny. Blurry; I only had a few seconds until we were live. KQED's Green Room has years of autographs and doodles covering its walls, including those of several cartoonists. I added mine next to Keith Knight's; figured he wouldn't mind. So was Pixar's Pete Docter. So was cartoonist Joe Sacco. I found a little open spot between Keith Knight, Gentleman Cartoonist, and physicist Michio Kaku. Seemed appropriate. Then on the way out I found Kelly Whalen waiting in the lobby for me! Kelly produced our animated Fire Story for KQED TV and I hadn't seen her since Emmy night, so that was a very nice reunion. Kelly Whalen heard me on the air and intercepted me in the lobby. As I joked in my earlier posts with Farrin Abbott, everybody in this photo has an Emmy Award. Except Kelly has a flock of them. She's the best. Thanks to KQED and Mr. Krasny for the airtime and a special morning. 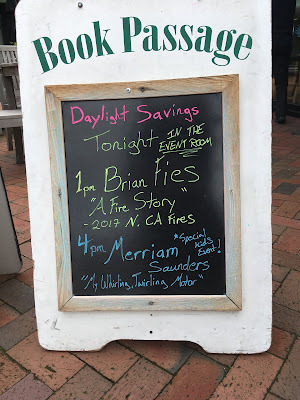 An Evening With Brian Fies?! 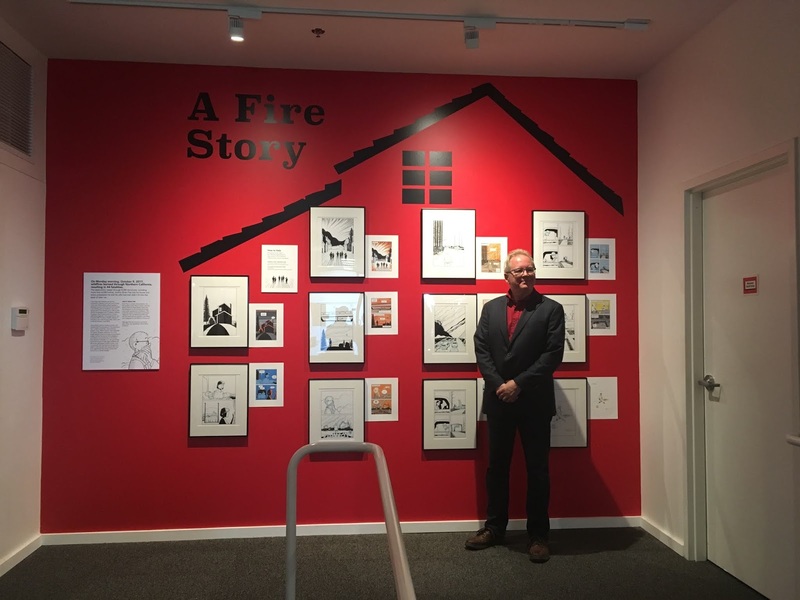 I had a tremendous time last night talking at the Cartoon Art Museum (CAM) in San Francisco, which everyone should visit often. I had no idea who would show up for "An Evening With Brian Fies." 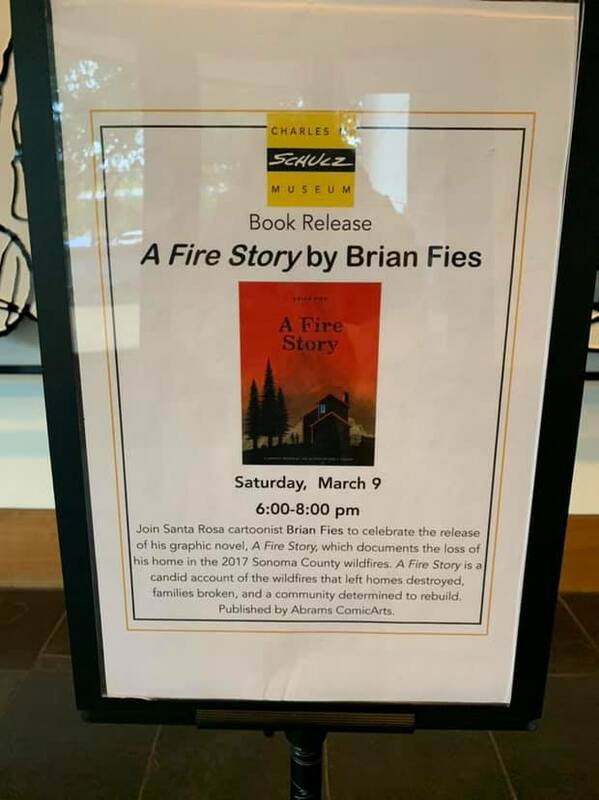 Turns out about 20 folks, including comics greats Trina Robbins and Steve Leialoha; cartoonist, professor, and my friend Nick Sousanis; Association of American Editorial Cartoonist stalwart Scott Burns; and the person who animated my Fire Story webcomic for KQED and won us both Emmy Awards, Farrin Abbott. Looking over the notebook in which I drew the original Fire Story webcomic, which I don't usually bring along but CAM seemed the right time and place do it. I signed all those books on the table, and more. CAM seemed to think they'd sell them sooner or later. With the AAEC's Scott Burns. Nick Sousanis took time out from drawing his next mind-blowing super-intelligent comic to spend an evening with me. He also impressed my daughters, to whom he talked for quite a while without knowing they were related to me, which I thought was great. He's a natural teacher. Everyone in this photo has an Inkpot Award from Comic Con International. 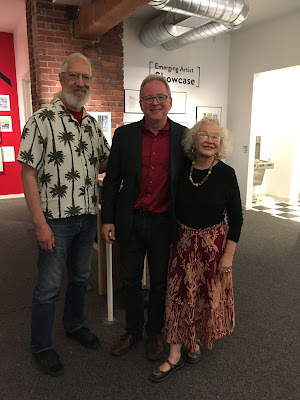 I'd never met Steve Leialoha and Trina Robbins before but admired both for decades. Both have done standout work in comics and it meant a LOT to me that they came. I'm more stunned than I may appear. Everyone in this photo has an Emmy Award. I was so happy to see Farrin Abbott again. Last time, we were both wearing tuxedos. My daughters Laura and Robin were there. CAM's Summerlea Kashar treated us to dinner. 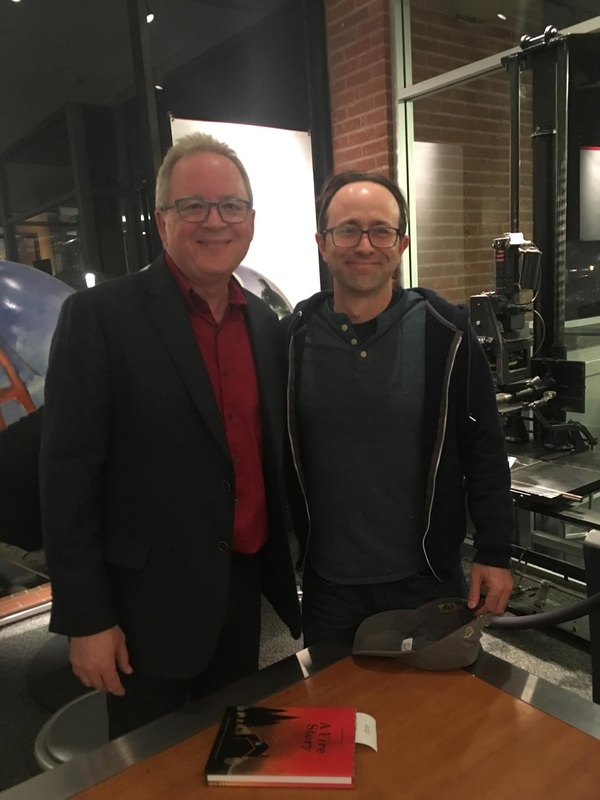 Curator Andrew Farago graciously introduced me and came with his wife, cartoonist Shaenon K. Garrity, and their son Robin (who enjoyed meeting my Robin). CAM's Nina Taylor Kester cracked the door open for me (that's a private joke) and made me feel at home. The audience was not necessarily huge in quantity, but Wow what QUALITY! Andrew Farago introduced me. 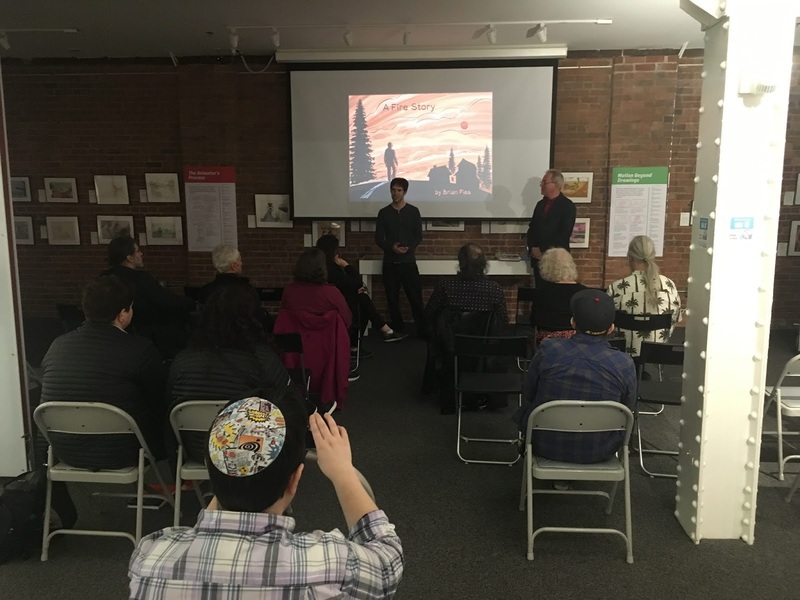 In the foreground, Nina Taylor Kester livestreamed it on Facebook. CAM is a great institution and it's a career highlight to have my work on display there. Visit! Today Karen and I moved into our new house, rebuilt on the exact site of our old house. It's been 535 days since our house and thousands of others were destroyed in the Tubbs Fire. We're happy, exhausted, numb, more happy, and can't quite believe it. It's keen. Out of 170 destroyed in our neighborhood, we're the fourth to come back. The nights are very dark and quiet. Construction's going on all around us. There's a guy digging up pipe in my front yard right now. We don't care. We're home. 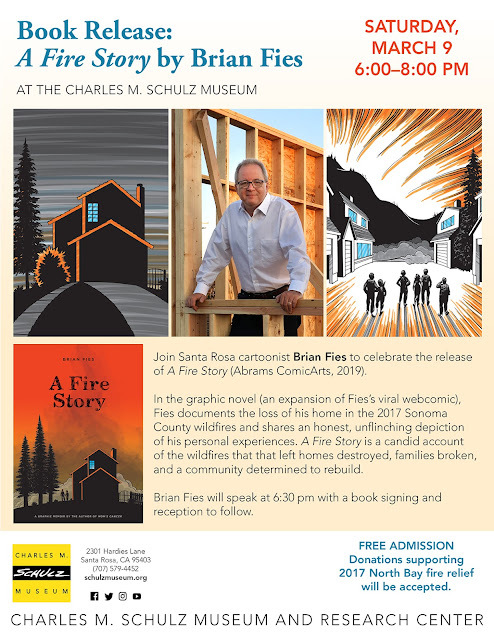 March 30, I'll be at the Cartoon Art Museum in San Francisco for a talk and signing to go with an exhibition of original art from A Fire Story. Wow! That exhibition is actually on the walls already, we just couldn't schedule the party until the 30th. I haven't seen it in person, but the photos look fantastic! Thanks to Andrew Farago and CAM for the honor. 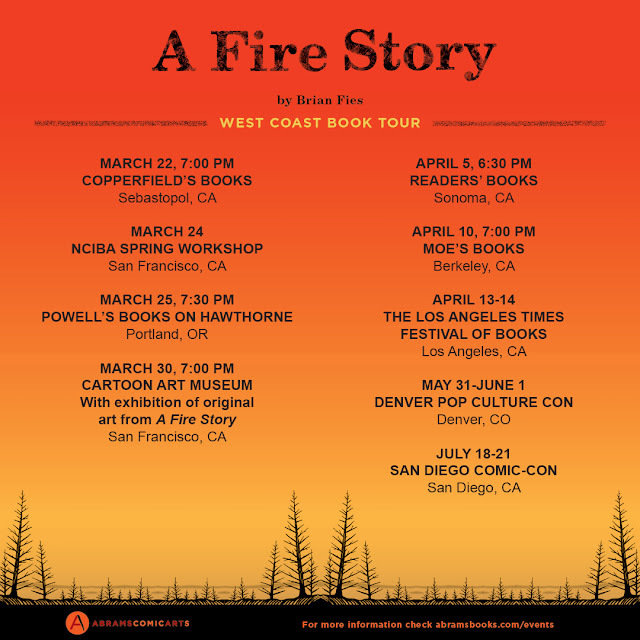 April 10 I'll be at Moe's Books in Berkeley, Calif., one of the Bay Area's most venerable heroic local independent booksellers. Looking forward to it! For local folks, I hope to see you this Friday at Copperfield's in Sebastopol, another fine heroic local independent bookseller who's been very supportive of my work over the years. Thanks for everyone who has come out or plans to come out. I've never really book-toured before; what I'm learning now is that every person who shows up, and every book sold, really makes a difference in how the bookstore and even my publisher feel about the book. 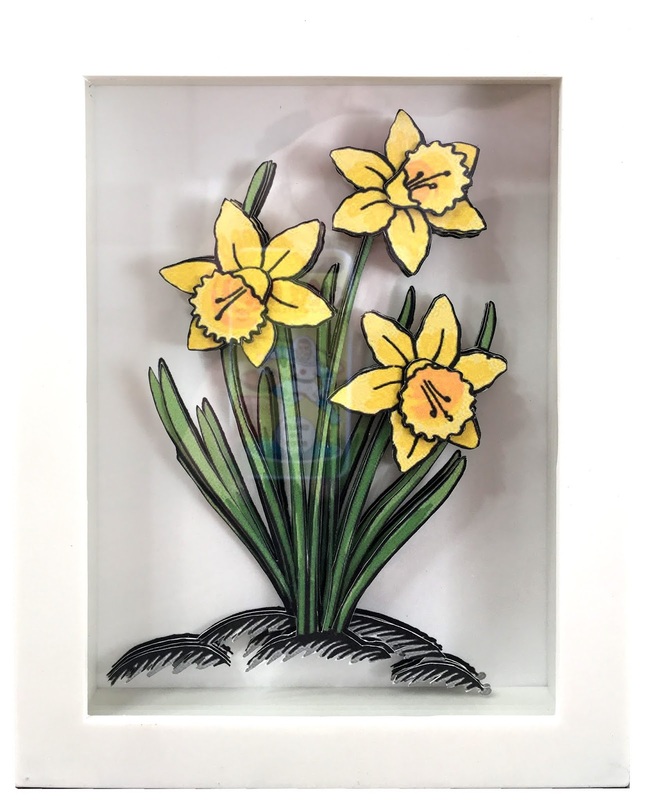 Daffodils from A Fire Story. This is Karen's favorite drawing from the book; she may claim this one for herself. Again, photos don't really do these justice, partly because of reflections in the glass. The climax of The Last Mechanical Monster. This is at least five separate layers of precision-cut paper, all stacked and spaced to give a stunning 3-D effect. Photos don't do them justice. 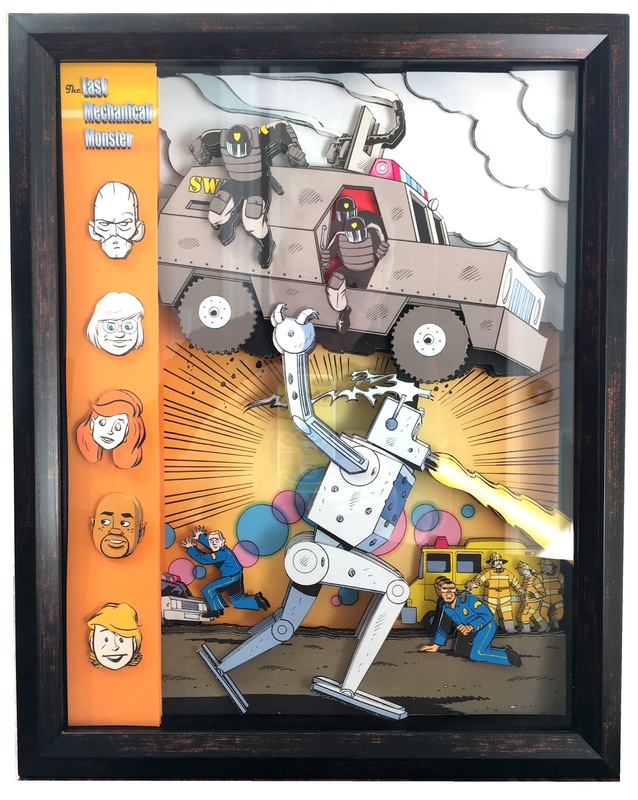 They're multi-layered cutouts of my art in shadowboxes that gives them an astounding three-dimensional effect. The thoughtfulness Steve dedicated to these, deciding which parts of the picture should be at which level, particularly on the Last Mechanical Monster pic, is very impressive. I have no idea how he cut out the art; I can only imagine him hunched over a board with a scalpel and magnifying glass. In person, they're breathtaking! Both will have places of honor on my studio wall, as soon as I have a wall. I don't know Steve. All I could do is stammer out my deepest thanks before he was gone. I hope he sees this and knows how much I love them, not just for what they are but for the time and care he obviously took to make them. A whirlwind weekend! 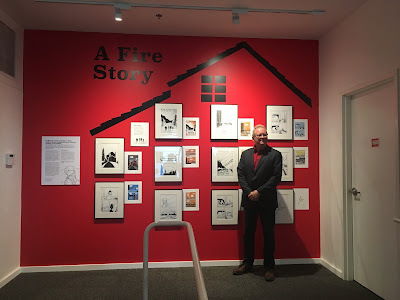 Saturday night: a spectacular book launch at the Charles M. Schulz Museum. 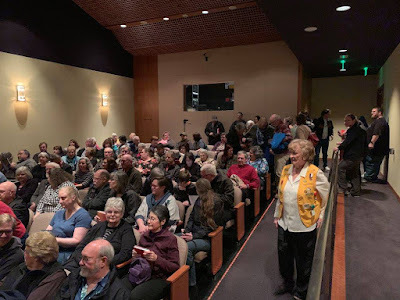 More than 200 people showed up, overflowing the museum's little auditorium and packing the Education Room upstairs, where my talk was simulcast. So many friends, covering every stage of my life: high school, early jobs, cartoonists, new and old neighbors! My family came, including my daughter Robin, who I didn't think would be able to make it and surprised me. Local independent bookseller Copperfield's brought about 75 copies of A Fire Story and sold out. They also carried Mom's Cancer and Whatever Happened to the World of Tomorrow, which I really appreciated, so I signed a few of those. Other people brought books they'd bought elsewhere. I signed my custom bookplates for people who couldn't get a book but promised they would later. 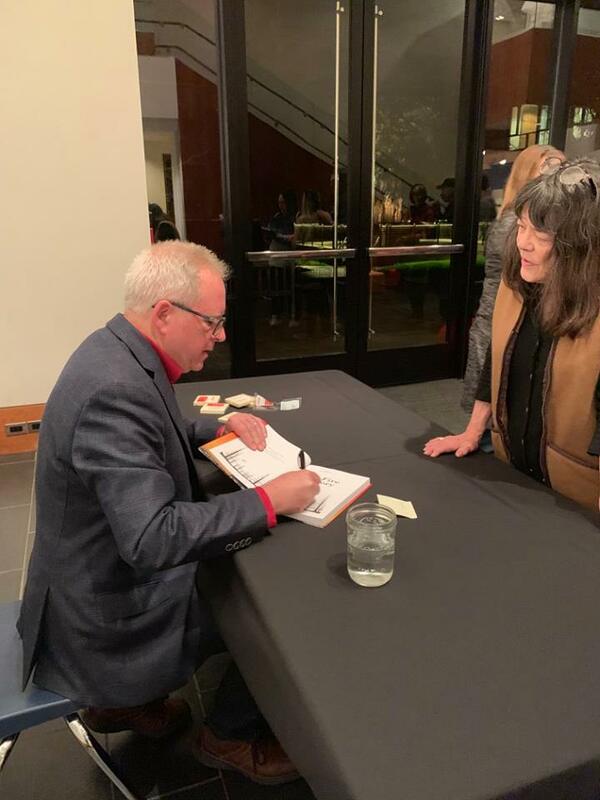 I spoke for about half an hour, then signed books for more than an hour. Best part was introducing several of the people who appear in the book, who had seats of honor up front. I asked for a show of hands of people who'd lost their homes, then those who had close friends or relatives who'd lost their homes; nearly every hand was raised. 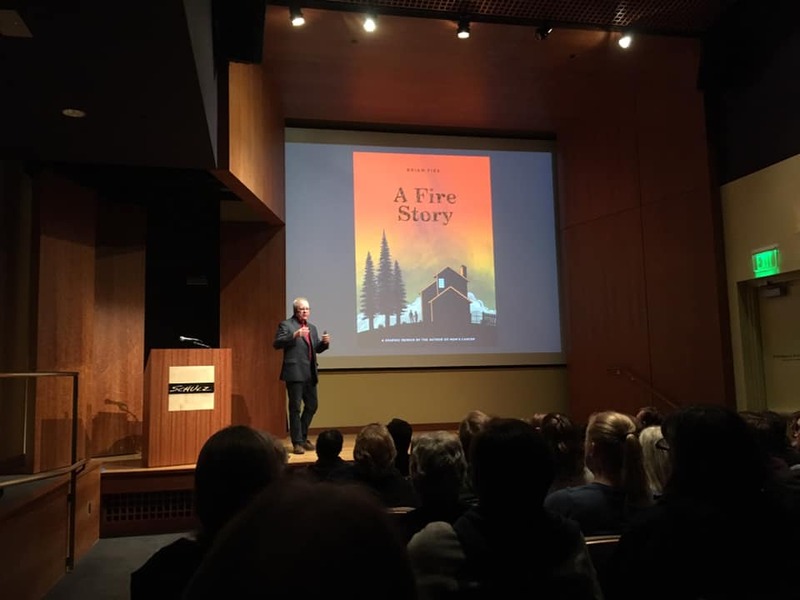 It was a hometown crowd of people who'd been through an extraordinary disaster together, very powerful. We cried, we laughed, we cried some more. 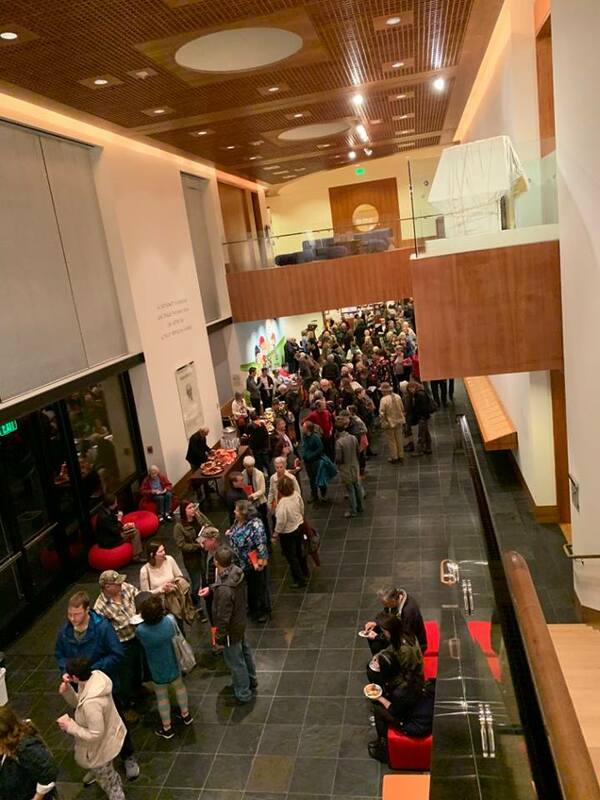 People lined up to buy books from Copperfield's before my talk began. Possibly the coolest I've ever looked in any photo in my life. Nice view from about halfway back in the auditorium. Photo from Raina, thanks! Some of the folks in the Schulz Museum's auditorium. The hall filled to standing room only. I see many good friends in this photo! 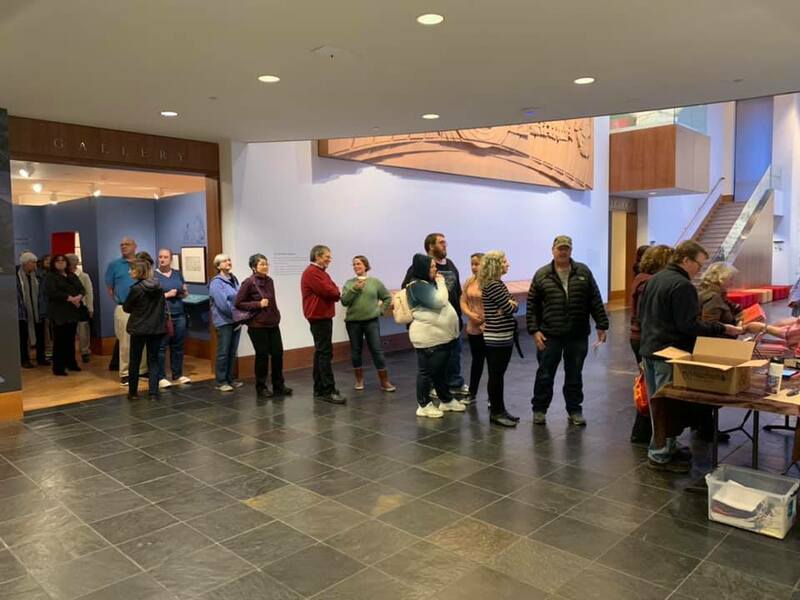 The line for my book signing in the museum's Great Hall after the talk. I'm sitting off screen to the lower left. The Schulz Museum provided a very nice snack spread for folks to nibble on while they waited. The museum really went all out for this--after-hours, snacks, staff and volunteers on duty. I'm touched. 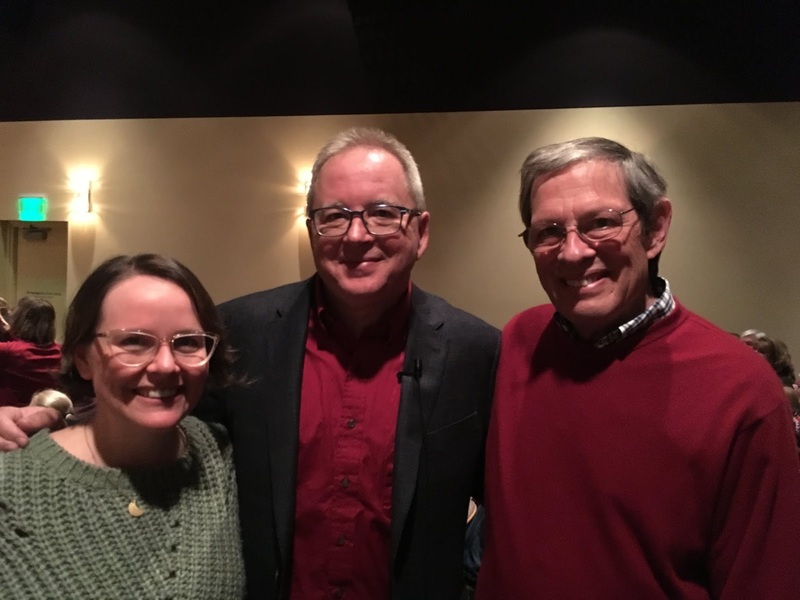 So cool to have Raina Telegemeier and her father Denis at the launch. I've known Raina since before Smile, and her dad has become a real friend as well. They had to drive a ways to get here; it meant a lot to me. With Cartoonist Maia Kobabe, whose graphic novel Gender Queer comes out in May. I'm looking forward to it, I know it'll be good! 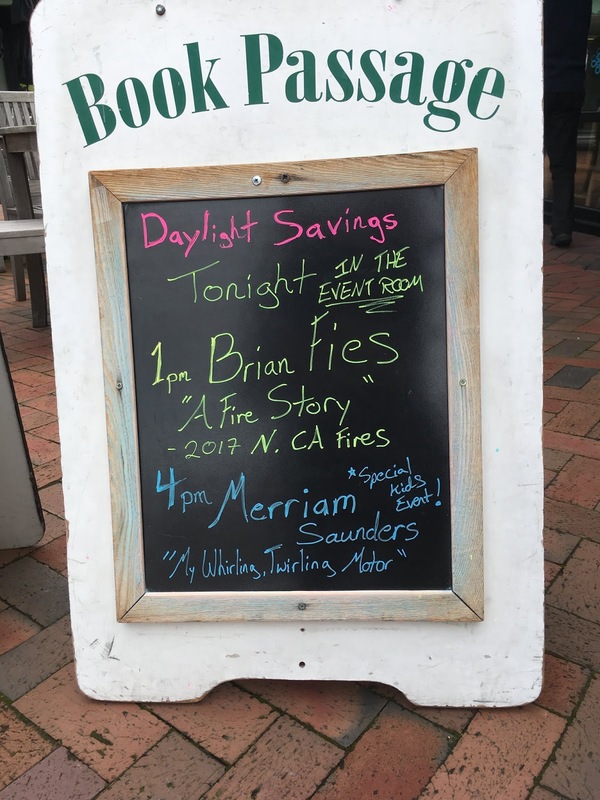 Sunday was mellower: a signing at Book Passage, one of the Bay Area's great bookstores, in Corte Madera, Calif. About two dozen people, only a few of whom had direct experience with the fire, with a very different energy, but it was really nice. I like talking to smaller groups (and I've talked to much smaller, like groups of two or three). You can have a conversation. Heading into Book Passage on Sunday afternoon. Book Passage set up a nice display at the entrance. Notice the book standing on the counter by the register, and the giant cover on the back wall! A nice-sized crowd of nice people--including one fan who gave me an amazing gift that knocked my socks off. But that's a topic for a future post. Two different experiences, both great, that gave my book a spectacular launch. But I've got to say, my night at the Schulz Museum was a special once-in-a-lifetime thrill. Thanks to Jessica Ruskin, Karen Johnson, and Jeannie Schulz for making that happen. Photos from many sources, including my daughter Laura and sister-in-law Cathy. Thanks again to everybody who helped make this weekend so special! I made BOOKPLATES, which I designed especially for A Fire Story, and will happily send free to anyone who asks! A bookplate is basically a sticker that I will inscribe however or to whomever you want, sign, and mail to you. Then you stick it in your book and BLAMMO, signed book! I did this with Whatever Happened to the World of Tomorrow and it worked great. 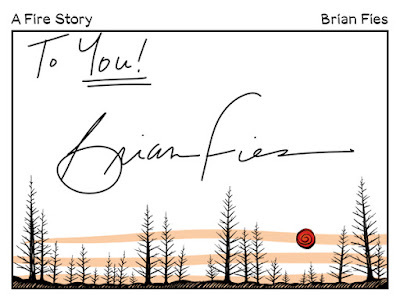 Email me at brianfies(AT)gmail.com with your mailing address and how you want the bookplate inscribed. 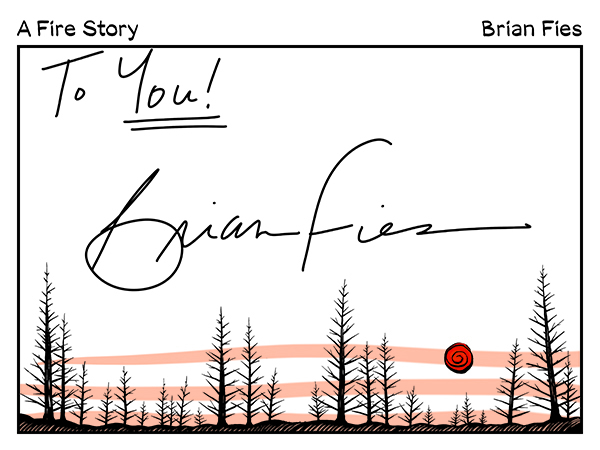 Do me a favor and use the Subject Line "Bookplate." 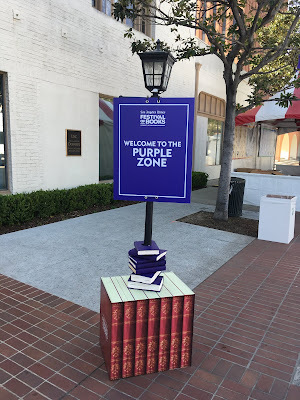 I'll send as many as you want, but we're on the honor system here: please don't ask for more than the number of books you have because it comes out of my pocket. And if someone still really wants their actual book signed, and is willing to pay postage both ways, contact me at the same email address and we'll work it out. But really, a bookplate is even better! And thanks for reading my book. 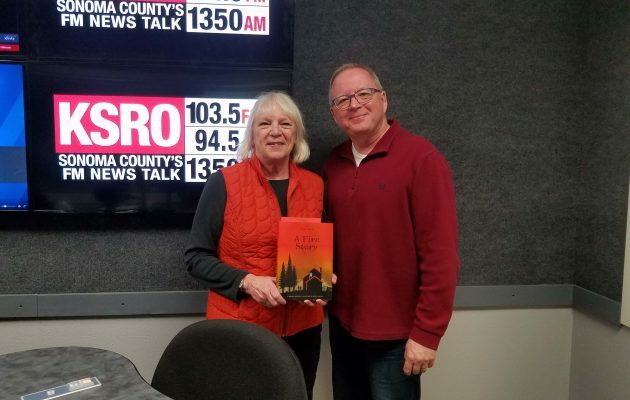 I did an interview with local news radio station KSRO yesterday. DJ Pat Kerrigan is a long-time pro who did amazing work keeping the community informed during the fire, and we had a nice conversation. 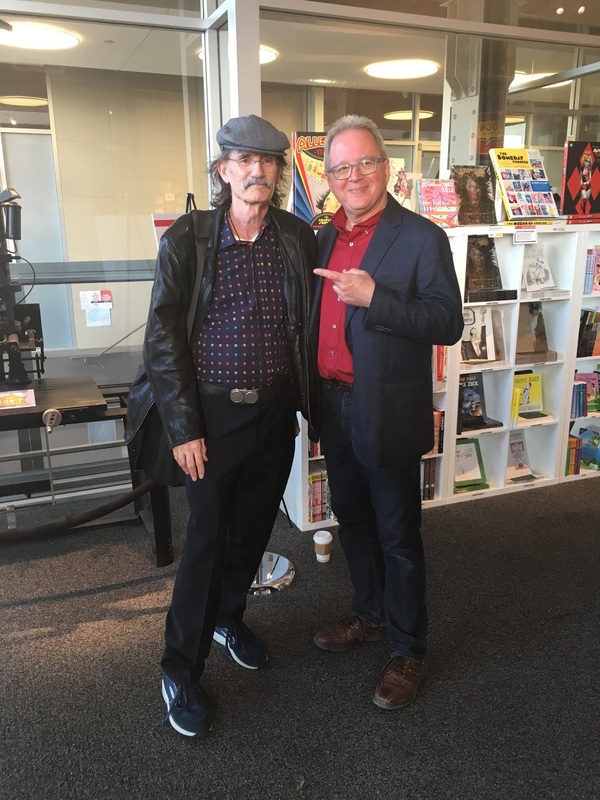 Since it was radio I didn't bother dressing up; if I'd known they were gonna take a photo, I'd've worn a proper shirt. Click the link if you want to hear 11 minutes of me. Here's the plan! Looks like I picked the wrong month to give up amphetamines. * Many great bookstores on the list, most of which I've never been to. Subject to change, including maybe one or two additions. 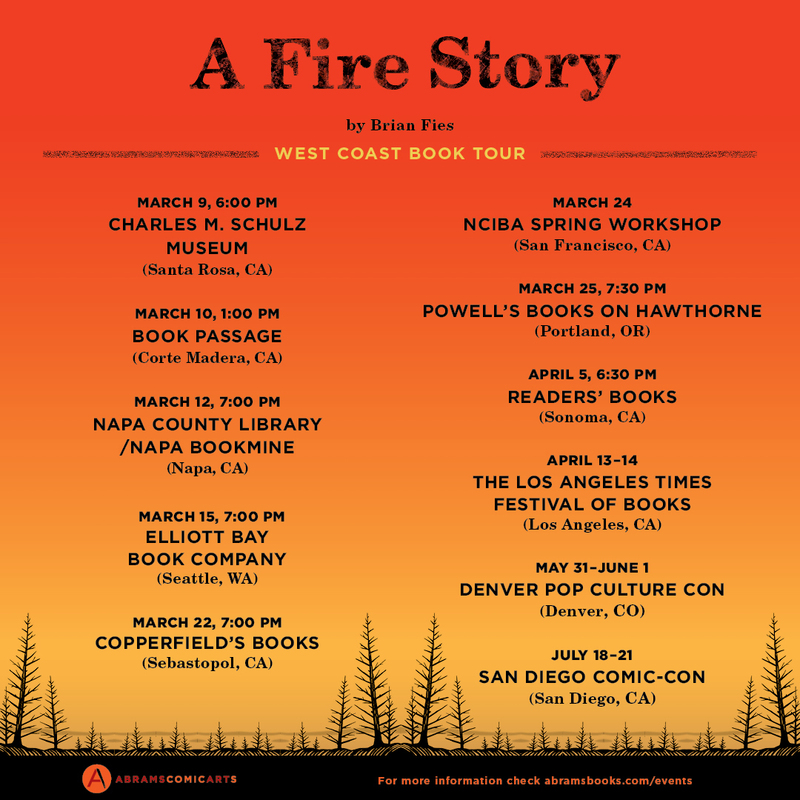 Come out, say hello, and support your heroic local independent bookseller! * I do not abuse amphetamines.